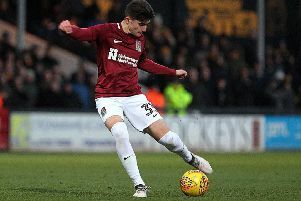 Boss Keith Curle has revealed the depth of soul searching that took place within the Cobblers squad and coaching staff following last month’s 4-0 home defeat at the hands of Colchester United. The clash at the PTS Academy Stadium on February 2 was a humbling experience, and the low point of Curle’s time in charge so far, since he took over from the sacked Dean Austin at the beginning of October. Curle is still adamant that was a game that could have ended up in a very different scoreline if Town had taken their chances on the day, and that is the case, but he admits the fact things all went so horribly wrong led to a serious rethink behind the scenes. Town have reacted to that thumping at the hands of the U’s by going on a five-match unbeaten run, winning three times on the road, and have eased 15 points clear of the relegation zone with 11 games of the season remaining. The manager has been delighted with that response to what was a humiliating afternoon for him and his players, and said: “There has been a fantastic reaction after the Colchester result. “Sometimes having a 4-0 scoreline lays everybody open to criticism, myself included, but it also gives you a starting point to rebuild. “Rather than hiding behind the result, and saying if the game had been the same but ended 1-0, then probably a lot of things might not have come to the surface. “But we used that result in a positive vein, with the meetings we had with the players, and also the meetings we had with the staff, and not dismantling some of the things that we had been trying to build, and trying put in place. “Sometimes you need such a deficite scoreline to refocus, and realise the necessity of doing the simple things well. To a man that is what has happened in the changing room. “Nobody likes being beaten, nobody likes being turned over, nobody likes a 4-0 as we don’t like losing. And he added: “The reaction of the players has been pleasing, as they haven’t melted. “We have set them individual challenges, and what we said to them after the Colchester game was ‘have you done that?’, ‘did you do your job?’, as an individual. “We just highlighted those things, there were lost of conversations, lots of meetings and every say we were able to reiterate to the players, ‘this is your job and this is what needs to be done’.